In 10-inch nonstick skillet heat oil over high heat. 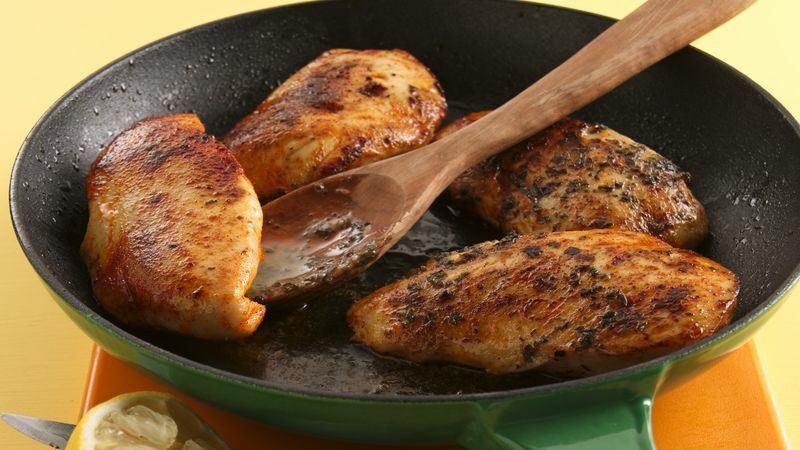 Sprinkle both sides of chicken breasts with paprika; add to hot skillet. Immediately reduce heat to medium-high; cover and cook 4 minutes. Meanwhile, in 2-quart saucepan, place hot water; cover tightly. Heat to boiling. Stir in rice; remove from heat. Let stand 5 minutes. Turn chicken; cover and cook 4 to 5 minutes longer or until juice of chicken is clear when center of thickest part is cut (170°F). Remove chicken from skillet; place on serving platter. Cover to keep warm. In same hot skillet, mix butter, lemon juice, basil and salt. If necessary, return to heat to melt butter. Place rice on serving platter; arrange chicken over rice. Spoon butter mixture over chicken. To shave off a few minutes of cook time, use a mallet or rolling pin to pound the chicken breasts to an even thickness.